Today, my consultant showed me how to wash my hair. She even rolled it up on rods for me. It turned out pretty cute. She said I had no slippage, so that was great news. I admit, I didn't do much to it over the last 2 wks. So, I didn't expect any slippage. However, I did notice my scalp was a little dry prior to the washing. She told me to drink more water, but don't put anything other than water on my locks. Because of my hair texture, I would have slippage if I used anything else right now. I also found out that my locking pattern is a 4 and 4 reverse. From my understanding the 4 reverse is supposed to help stop slippage. Still loving my locs. I love being able to spritz them with water , finger comb and go. Wonderful! After 17 hours (excluding breaks) over 2 days ; I am finally sisterlocked! 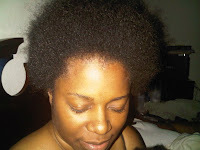 I have 487+ sisterlocks, approx 4 to 5 inches long. 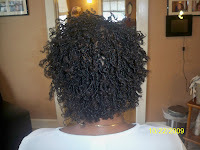 I love the curly q's on the ends. I'm due back in 2 weeks for a wash and check. I'm tired, but I am soo excited! So far so good! 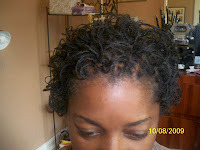 I finally did the Big Chop and the end result (in 1st pic above) was an uneven 4 to 5 inch fro. 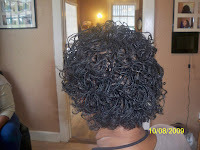 I talked to a lot of Sisterlocks consultants and had a few consultation's before deciding to go with Karen. 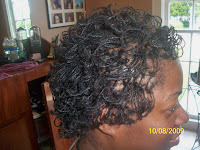 She has been dealing with natural hair long before becoming a Sisterlock consultant. I found her very informative and patient with all of the questions that I had. 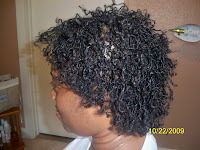 Karen has Sisterlocks herself and they were very nice. She wears hers in a short funky style. Very cute and stylish on her. Well my test locks held up pretty good. I thought they were quite cute. I won't deny that I was a little nervous about how they would look all over my head. But I had done my research so I knew what to expect. Nov 2008 my mom had gotten really sick and I was going about out of my mind. Through the course of dealing with the possiblity of losing her, I had become truly tired of dealing with everything. My hair started falling out and I started gaining alot of weight. That's when I decided something had to change. 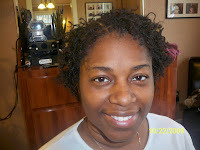 I was due for a perm retouch and decided against it. 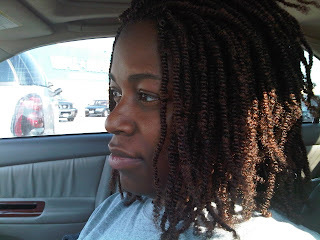 I began getting my hair twisted on a consistent basis. 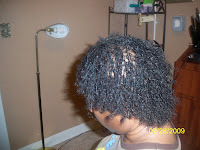 In between taking the twists down and getting them put back in I began cutting inches of my permed ends off. 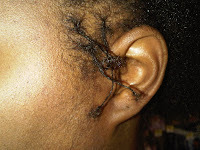 It was then I remembered one of my friends had gotten her hair sisterlocked. Since I hadn't seen her in a year I wondered how they turned out. After seeing a picture of her locks, I knew this was the move for me. Her gorgeous locks were small and styleable. 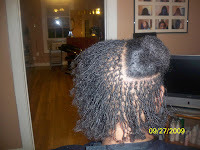 Thus began my research into sisterlocks. 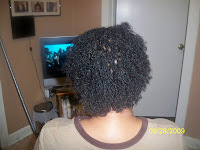 Here is a pic of my hair in nubian twists during my cut and re-twist phase.